Barrie Colts 2014 Training Camp Schedule. - Very Barrie Colts | A website covering the Barrie Colts of the OHL. Home 2014 Barrie Colts blog Brendan Lemieux Kevin Labanc. 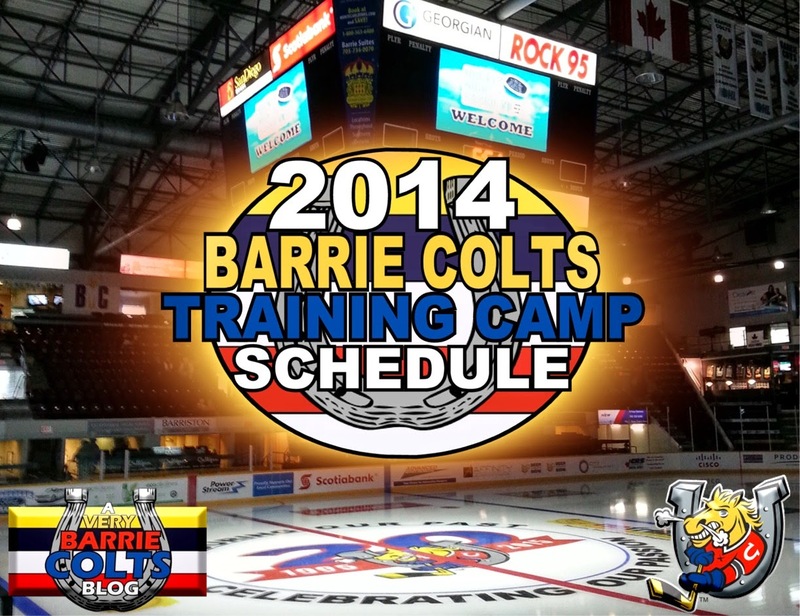 OHL Training Camp Barrie Colts 2014 Training Camp Schedule. Barrie Colts 2014 Training Camp Schedule. Yesterday the Barrie Colts announced their schedule for their upcoming 2014 training camp. It was said that the players, prospects and tryout hopefuls will be split into 4 teams and they will all participate in practices, scrimmages as well as the annual blue and white game. Some of the names that have been announced to participate in this years training camp are Buffalo Sabres 2nd round pick Brendan Lemieux and San Jose Shark draft pick Kevin Labanc who both put up eccellent campaigns last season. Also announced to participate is in this years camp is Barrie Colts 2014 first overall pick Givani Smith, 2014 import draft pick Rasmus Andersson and recently signed Roy Radke. All the events will be available to the public for free and will be held at Barrie Molson Centre. Here are the dates, times and list of events. Scrimmages from 9:30-11:45 a.m. and 1:00-3:15 p.m.
Practices from 9:30 – 11:30 a.m.
Blue and White Game at 7:00 p.m. Practice from 10:00 – 11:30 a.m. This is an excellent chance for fans to not only get a preview of the team for the upcoming 20th Anniversary season, but will also help fill the time between now and when the Colts play their first pre season game on Sun, Aug 31's in Owen Sound.